Girlguiding Wiltshire North is a charitable organisation which provides opportunities for over 3,600 members to enjoy the unique experience that guiding offers. People sometimes forget we are a charity and our members hugely value the support that we receive from our local communities, friends and parents. There are lots of ways that you can help us to continue to deliver good guiding right across the county. Our members love to get ‘out and about’ and experience new activities. If you are running an event or activity where we could join in, or we could attend to promote guiding in the local area, please email your local Division <see map>. We have visited local radio and TV stations, been involved in carnivals and festivals. Promoting guiding locally allows girls to find out about the opportunities for them and encourages adults to volunteer with us. You can help simply by telling your friends and work colleagues about us. If your company offers time for volunteering or undertakes team building projects for charities, there is always something enjoyable and rewarding that you could do for us. If you are enthusiastic about what we do and are able to shout about it, you might like to become an Ambassador for Girlguiding Wiltshire North. Ambassadors come from all walks of life and recognise the value of guiding and its contribution in providing positive opportunities for girls and young women. Acting as an Ambassador can be as simple as speaking at an event, or using your professional skills and networks to spread awareness about guiding today. If you want to help to shout out about what we do, then join us today and support us as we spread the word about the opportunities available through guiding. You can buy guiding wear, resources and gift items from our County Trading Depot (Guide Shop). Our depot volunteers can advise on guiding wear choices and you can try on before you buy. You will also find a wide range of gift items to suit all pockets and occasions. By purchasing in the depot, you will save on postage and packing. For Leaders, there is information on resources and badge prices together with an order form in the Members’ Area. A mail order service is also available, particularly useful for badge collectors who wish to order our County standard badge (shown below). All profits made by our Trading Depot go directly back into local guiding to benefit our members. Opening hours (term time only) are: Thursdays 3pm – 7pm and Saturdays 10am – 4pm. Our residential centre in East Tytherton (near Chippenham) is available for hire for not-for-profit organisations: schools, charities, social groups etc. From a single room with use of the kitchen to the whole building and outside space, we are pleased to be able to share this facility with others. Find out more here. There are two ways of raising extra funds at no cost to you – how amazing is that! 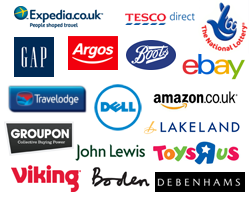 You can raise money for us while you shop online with over 2,700 retailers, including big name brands such as Amazon, Next, Sainsbury’s and Expedia. Let's say you want to buy something from Amazon. Instead of going to Amazon directly, you first go to easyfundraising.org.uk then click through to Amazon to make your purchase. This tells Amazon you came from easyfundraising. The price of whatever you’re buying is exactly the same. Once you’ve made your purchase Amazon will make a cash donation to your nominated cause (eg your daughter’s Rainbow unit); easyfundraising then collect this cash donation and send it on at no cost. All units in our County are registered to receive donations, but if you would like to support all of us, select “Girlguiding SWE - Wiltshire North County” as your cause. Any donations will be used directly to fund activities for girls. If you are a taxpayer in the UK, you may be able to increase every gift you make to Girlguiding at no extra cost to yourself through Gift Aid. This means Her Majesty's Revenue and Customs will add an extra 25p to every £1 you donate. This applies to any donations made in the form of termly subs. Please speak to the unit Leader about Gift Aid or sign the authorisation on the ‘Starting’ Rainbows / Brownies / Guides etc. form. To make a Gift Aid donation, you must pay at least as much Income Tax (and/or Capital Gains Tax) as the amount of tax reclaimed by Girlguiding. This is currently 25 pence for every pound you donate.